To how many clothing retailers or brands would you say you were "loyal" to? 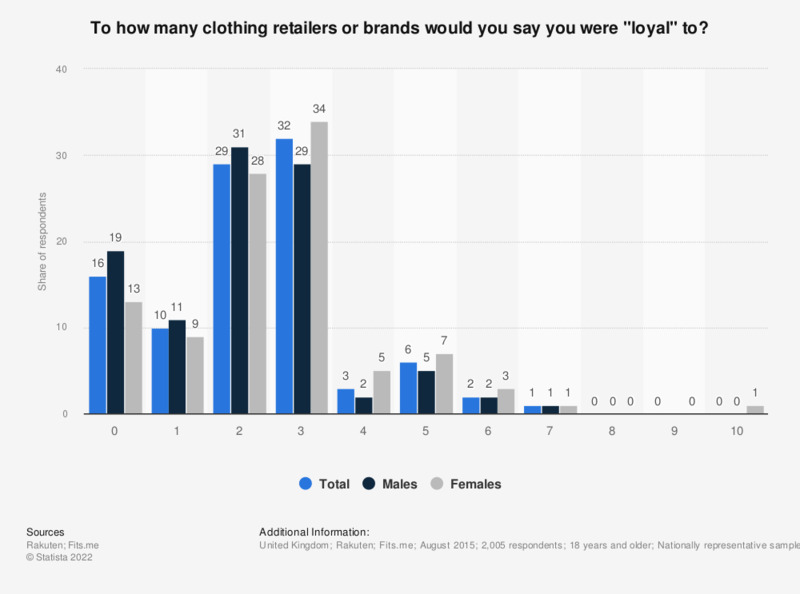 This survey was conducted to assess customer loyalty regarding clothes shopping, posing the question "To how many clothing retailers or brands would you say you were “loyal”?" The majority of respondents, accounting for 71 percent, reported being loyal to either one, two or three brands, where as zero percent stated being loyal to either eight, nine or ten brands. Statistics on "Clothing stores in the UK (Kantar Media TGI)"
Which factor would be most likely to increase your loyalty to a clothing retailer or brand? Would personalized showcasing increase your likelihood of buying from a retailer? Would it help you to choose a clothing if the retailer only showed you items they know you like? Which of the following statements most closely describes your clothing shopping habits? Which best describes how you feel when a retailer suggests an item and you feel it is the wrong one? Which information would you be happy to share with a retailer in return for a personalized shopping experience? What best describes your feelings about a clothing retailer alerting you to items that fit you? What would you like to see the most in return for sharing information about yourself with a clothing retailer? What would you second most like to see in return for sharing information about yourself with a clothing retailer? Which of the following are you happy to share with a retailer while shopping? How good is your favorite clothing retailer at giving you an individualized experience? Do you find it annoying to have to search through a lot of clothes to find the items you want?